So a little while ago I was looking out my kitchen window and I could see a squirrel in the yard trying to uncover the walnuts he buried. We have a big walnut tree in our backyard and we pretty much leave all the walnuts to the squirrels. I love to spend the fall watching them gather all the nuts off the tree and hide them in the yard. They bury them in the grass and the landscaping, which I find both really cute and really irritating in the spring when I have to go around and pull up little walnut tree starts from all over my yard. Anyway, right now there is snow on the ground and the poor squirrel was digging through the snow to get to his walnuts. Amazingly he he found some, but I felt bad for him because it's so cold, lol. I'm crazy, I KNOW, but I'm so soft hearted when it comes to animals! So anyway, I decided that my squirrels needed a Christmas present, so I went to the bird store (my favorite store in town!) 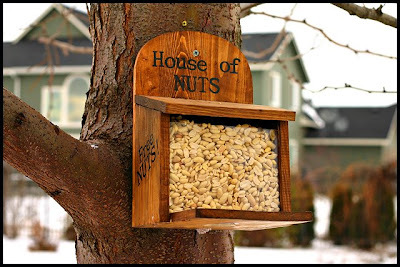 and I bought a squirrel feeder and some peanuts. So now my squirrels won't have to work so hard. They can stay fat and happy all winter long with a tummy full of peanuts. Merry Christmas, squirrels! Here's a photo of the feeder, and I'll attempt to get one of the squirrels at the feeder later!